While many of our ThinkGenetic teammates helped others “harness their inner power” at the National Society of Genetic Counselors Annual Conference in Columbus, Ohio, ThinkGenetic CEO, Dave Jacob and I continued that theme and represented ThinkGenetic at the vibrant 2017 RARE Patient Advocacy Summit, hosted by Global Genes, in Irvine, California. The RARE Patient Advocacy Summit was the perfect place for ThinkGenetic to join like-minded people brainstorming new ways to solve complicated problems related to genetic conditions. 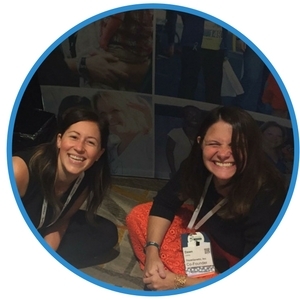 Joining rare disease advocates and community stakeholders from across the globe, we connected, collaborated, and activated in alignment with event’s theme. It was such a pleasure to watch ThinkGenetic CEO Dave Jacob activate! 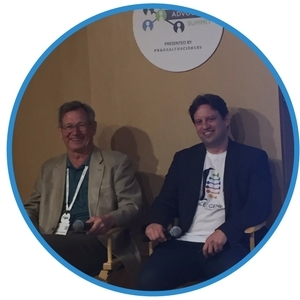 In a room filled with advocates and other interested parties, Dave joined FDNA founder, Dekel Gelbman, in a two-man technology panel discussing the use of artificial intelligence (AI) to shorten the time to diagnosis. 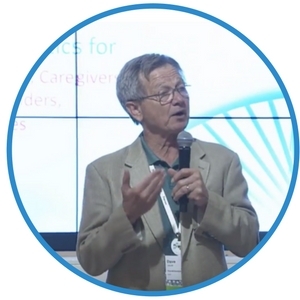 At the session, Dave presented ThinkGenetic’s SymptomMatcher, a new paradigm for undiagnosed individuals to find possible genetic explanations for their symptoms. He eloquently explained the personal story behind ThinkGenetic and the workflow of ThinkGenetic’s growing knowledge base. He also demonstrated the power of SymptomMatcher with a realistic example starting from a typical Google search of symptoms and ending with a list of possible genetic conditions for that person to discuss with their healthcare provider. Meanwhile, in the audience I received a flood of passed notes from excited advocates with requests to add their condition(s) to the ThinkGenetic knowledge base. The requests were quickly passed hand-to-hand, in a way that harkened back to life before smartphones. The advocates’ immediate enthusiasm may in part be due to the recognition that ThinkGenetic was founded as a patient and a genetic counselor’s labor of love, brought to the light of day through hard work and innovation informed by the advocacy community. A very creative and fun example of collaboration at the RARE summit was the puzzle piece art project. Global Genes invited advocates and stakeholders to create individualized puzzle pieces as visible representations of their mission. No matter their underlying artistic skill, the advocates’ determination to convey their passion for their mission in their pieces was obvious. 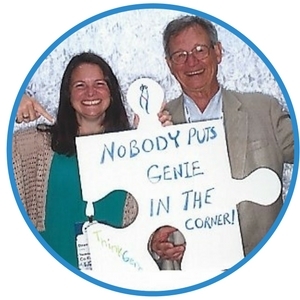 ThinkGenetic was there, side-by-side with our advocacy partners, making our ThinkGenetic “Geney” puzzle piece. When all the individual pieces were completed, we joined them together to make one giant, fabulous, symbolic piece of art: A visual representation of the genetic advocacy community. This project reminded us all that, even though the daily work of improving awareness and fighting for treatments and cures in the rare disease space can be isolating, there is a strong supportive community that collaborates and understands each other. If we just look to the right and left, sometimes there are others there to help, understand, and buoy each other up during the dark times – because in the genetics world, those times are a reality. Desiree Magee from her brand-new organization Daphne’s Lamp, which has just joined the advocacy world. They have already spearheaded a United Mitochondrial Disease Foundation project pulling together mitochondrial advocacy moms to join forces and raise awareness of mitochondrial conditions. Speaking with Vanessa Rangel-Miller of Invitae as she continues her amazing work creating the Patient Insights Network in the genetics community. Seeing Kim Tuminello, Association for Creatine Disorders Director of Advocacy, (a ThinkGenetic Advocacy Partner!) share her insights on advocating for GAMT to be included on newborn screening around the world. Watching Patricia Wood of the NBIA Disorders Association pass over a pile of literature during Dave Jacob’s talk to emphasize her commitment to the community she represents. Learning about Patti Engel and the ENGAGE Health team, who with the Rare Collective team has taken a collaborative approach to all aspects of clinical trials to help get genetic disease clinical trials moving effectively and efficiently. Discussing very productive topics with Scott Mellis of Regeneron, a pharmaceutical company that is helping find key modifiers in addition to their therapeutic goals. Connecting with Mindy Burnwork of Midwestern University about her work teaching the next generation of pharmacists more about genetic treatments. Catching up with Julia of the Canadian Fabry Foundation, who is organizing patient empowerment workgroups, and the countless other ground-breaking advocacy work that is being done in the community. We’re thrilled to welcome them as a new ThinkGenetic Advocacy Partner. The ThinkGenetic team came away from the collaborative Summit feeling very inspired. We were thrilled to find so many kindred spirits at the Summit, with a similar story of dedication and time investment in their hard work of turning wishes into reality. We look forward to continuing the conversation over the next year as we launch SymptomMatcher. Thank you for sharing in our mission of helping patients and family members living with genetic conditions get the information and actionable next steps they need to empower them on their journey.